Yes, I’m dreaming again but I do have able assistance. Take a look at Paula on Lost in Translation. The lady has a supreme talent in photography. These are all her images, which I’ve stolen in a good cause. I hope I’ll be forgiven. It’s ages since I’ve entered a competition but this one by Accor Hotels is too good to resist, even though I’m pushing the deadline. 24 Hours In… Just name your city, and off you go. My initial reaction- ’24 hours in Florence?’ Impossible!!! But then resourcefulness kicks in. I’m a huge fan of free walking tours. Nothing I like better than a good ramble and to just follow my nose, but my nose has a terrible habit of getting me lost. With time at a premium I’ll opt to follow ‘one who knows’. And afterwards pick their brains for good places to eat and whatever else I can pack in. 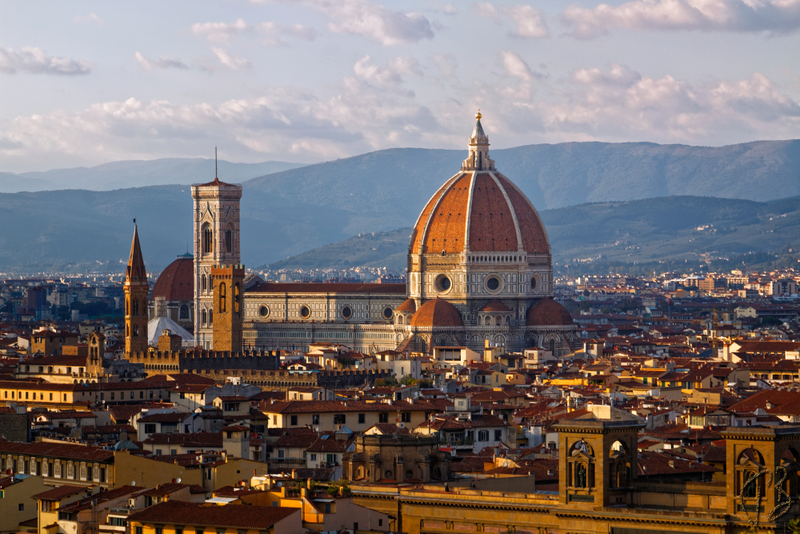 Florence Free Tour has 2 options. One at 11.00 and one at 14.00, both starting from the Santa Maria Novella church. I know I won’t be able to sleep for excitement so I’ll be up at the crack of dawn, grab a coffee and out on the streets to just absorb Florence. I’ve heard tell there are secret bakeries, open very early, so if I stumble upon a waft of pastry, so much the better. The other half is always reluctant to be prised from his bed but, if I can persuade him, I’ll have a slot booked at the Uffizi. They open at 8.15, so not too hard to escape the crowds. Culture tucked in my back pocket, time to join the morning walking tour, when I can hope to get my bearings. Afterwards I’m going to allow a substantial time for collapse and a leisurely lunch. 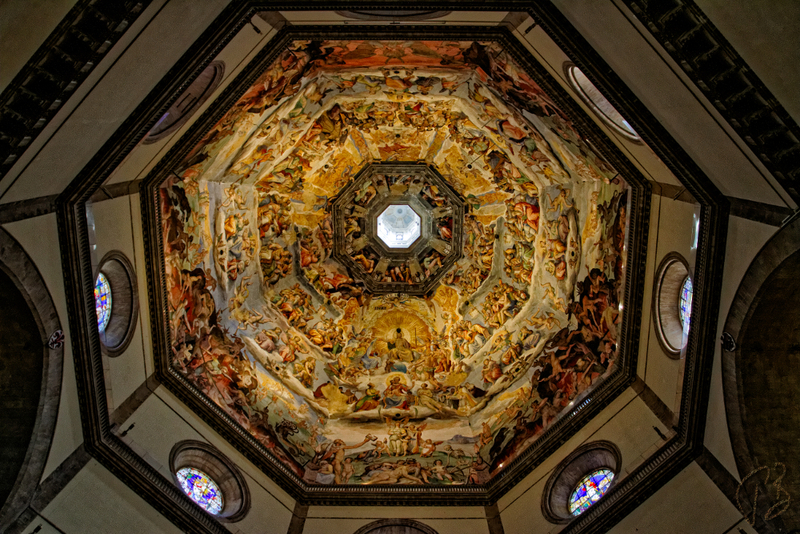 Somehow I have to find the energy to climb the 463 steps to get a proper look at Brunelleschi’s Cupola in the Duomo. I’ve seen Paula’s photo and I know it will be worth it. I always gravitate to a river, and in Florence there is the biggest incentive of all time, the Ponte Vecchio. I might have to pinch myself when I get there. Not since Venice have I been this excited! A browse through the arcades and a nice little cafe for a restoring coffee. (and I know he’ll want a cake!) There’s one more must see on my list. You can’t be married to a garden designer and not visit the Boboli Gardens. Even if it rains! It seems the perfect place to watch the sun set over this lovely city. Maybe there will be an evening concert at the Pitti Palace, but if not it will be a leisurely meal, and then just strolling and sighing until my legs won’t walk any more. I haven’t been there yet, but when I do, next February, I very much hope to enjoy this vista, at Twilight. And when I do I’ll be telling you all about it. Meantime, do you have any tips on how to spend 24 hours in your favourite city? Accor Hotels would very much like to hear them, and if you’re awfully quick there are super prizes! Paris, Amsterdam, Berlin ring any bells? I love your writing because the joy pulls one in – and looking forward to seeing your photos after the Feb trip. And I agree about Paula’s photos – so good with her touch. I think many travelers will agree that getting out to “see” is priority and sometimes that crack of dawn stroll is magical. And the enthusiasm gently layered in your words makes me smile in general. Funny how that happens. On a trip in Canada a few years back – hubs and I went out at the crack of dawn. Hungry for food and culture – but nothing opened til 7 and 8 a.m. But we were shocked at how late the streets opened up in that tourist town…. We have 4 whole days booked, Yvette, and I have 101 things to do in them, but mostly I will just gawp in amazement, and Mick will try to keep me from getting us too lost 🙂 🙂 Thanks, darlin. Never been to Florence, Jo, but from what I know about Renaissance art, I’d need at least a week! On the other hand, I could design a one day tour of Prague quite easily – lived there a year, and the city is quite compact. Can’t wait for your report, Jo. And if you ever want to explore Prague, just let me know! This deserves a win! The photos, the text all winners! What a great trip to look forward to. And I do hope you win with Accor. It’s years since I was in Florence. So long ago, I can barely remember it, except in a dream-like way.. I hope to add another memory (or two 🙂 ) How are you? Easing towards Christmas? Lots of hugs coming your way. Easing is the right word, Jo. It’s a beautiful city. I love your twilight photo. Paula’s! 🙂 I won’t be competing with her. I’ll just happy to be there. A match made in heaven Paula’s photos and your words 🙂 . . . . . so did you win? and if you did where are you taking Paula?!! Love Paula’s photos! And love your description of this most wonderful city. I hope you win! Good luck. Thanks a lot, Alison. 🙂 I’m a winner anyway because I have a few days in Florence already booked. I’ll definitely be climbing the steps, Gilda. 🙂 Food markets are not so much my thing so it will depend how the time goes. I’m really looking forward to it. How are you? Are you busy on a project because you don’t seem to be writing posts at present? You chose a great city. Have walked there, worked there, ate there, drank there, gawked and prayed there. Love it. I hope to do all of those things, Cynthia! (well, maybe only ‘work’ in the loosest sense 🙂 ) Beyond excited! Thank you so much for your presence here. I will get round to commenting – you’ve sent me off trawling the competition site and then wondering how I’d present Warsaw. I’ll probably tackle this beyond the competition boundaries. I like your Florence better than the ambassadorial accounts of Berlin, Paris and Amsterdam. Too much time spent eating, drinking and shopping! Whereas you amble and stroll and have a varied 24 hours. 8.30 at the Uffizi sounds great – most such things don’t open till 10, by which time I’m ready for an afternoon nap. I’m looking forward to visiting Florence with you. Hugs on a day when both lots of grandparents turned up for pick up! I really hope it wasn’t my wires that got crossed. Not loyal. Discerning. And your closer to my demographic. Wishful thing is fun. As for 24 hours in Warsaw, it’s on the list. But it may never happen. Ahhh Florence!!! The most beautiful place on earth. Twenty four hours is just too little time to spend in this stunning city. Even after a week I didn’t want to leave…wonderful memories came flooding back with your post…you capture the essence of Florence! We went to Uffizi very late in the afternoon and had it almost to ourselves. Surreal! I agree entirely! I have 4 nights and I know it will be too short 🙂 Thanks, Annika. Hoping to make some nice memories of my own. I did spend 24 hours in Florence… it was 32 years ago, but I remember the rain, the David, the smell of leather in shops, and the micro-mosaic bracelet I brought home… 🙂 I’d love to be there in sunshine! Yes, sunshine would be a huge bonus, Kana, but in February I daren’t hope for much. 🙂 So many snippets of memories down the years… 🙂 Thanks for your company. This is great, Jo. I wrote a similar post called Florence in a Day, but with a different take which came in the form of a tour guide geared toward children. We saw so much in such a short time window. I love the Biboli Gardens too :). I think it really concentrates the mind to have a short time frame, Corey. The reality will probably be very different because I will be so starry eyed. 🙂 (and I’ll have 4 nights!) Thanks, darlin.